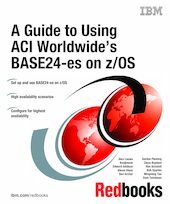 In this IBM Redbooks publication we explain how to use the ACI BASE24-es product on z/OS. BASE24-es is a payment engine utilized by the financial payments industry. Failure in a financial payments environment is a high-visibility customer service issue, and outages at any level have debilitating effects on customer loyalty. The entire payments cycle must be conducted in near real-time. In such an environment, high availability is a mission-critical requirement. We demonstrate how you can achieve a high availability configuration for BASE24-es on z/OS. We begin by outlining the requirements of a payments system, and then introduce the structure and functionality offered by the BASE24-es product. We describe the strengths and abilities of System z and z/OS, and explain the technical and physical architecture of BASE24-es on z/OS. We guide you in designing a system layout and in installing, tailoring, and configuring your workload on z/OS. Finally, we detail the numerous failure scenarios that we tested in order to verify the robustness of the solution. These scenarios were carefully selected in areas such as data environment, CICS/CICSplex, the BASE24-es application, and hardware. Communication was handled by ATM and POS device simulators and a Visa network simulator. Note that the information in this book is specific to BASE24-es release 06.2 and is subject to change in subsequent releases of the product.